"First, Desirable" "Bitter Affliction" "Earthly Heighth" "Sacrifice of Labor" "Prince of Joy" "Love of A Brother" "Just People"
33-70 AD 70-313 313-1157 1157-1367 1367-1517 1517-1874 1874-? For more detail, click on individual Church name. 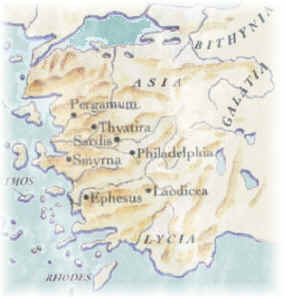 According to Thayer, Ephesus was "a maritime city of Asia Minor, capital of Ionia and, under the Romans, of proconsular Asia, situated on the Icarian Sea between Smyrna and Miletus." The chief splendor and renown of Ephesus came from the temple of Artemis, which was reckoned one of the wonders of the world. It is fitting that Gods true temple should have its beginning in this first or capital city of the region with a false temple. Hardly anyone in Ephesus knew of Gods true temple. Now, two thousand years later, who knows of Artemis? It was burnt and rebuilt and finally destroyed, and the world is better for that destruction. Meanwhile, the true temple is majestically nearing completion. It is wonderful to be on the winning side even though that does not exempt us from being opposed and maligned. The thought of "first" derives not so much from the Greek meaning of Ephesus as it does from the fact that it was indeed the "first" city of the province. The "angel" of this church was Paul. However, it is important to remember that Peter had assumed the leading role in the Jewish church on the day of Pentecost. It was Peter who opened the Gospel door to the Gentiles. As the work among the Jews became overshadowed by the greater work among the Gentiles, it fell to Paul to be the messenger. Paul wrote the epistle to the Hebrews, endeavoring to prepare the Jewish Christians for the demise of their nation, temple and the Jewish Law arrangement. Hence, it was Paul who was the messenger to both Jews and Gentiles in the church. Peter and Paul covered this era, with Paul singularly at the forefront once he began his ministry. The time frame of this period is subject to interpretation because nothing in the text gives a clear definition of the time covered. However, from Pentecost until the fall of Jerusalem does seem a special period of time�the most robust and dynamic for preaching the Gospel and establishing Christian churches in the region. We can understand how some may mark the fall of Masada in CE 73 or how others may view this time frame to extend to Johns closing days. However, CE 70 seems to be the time when the leadership of the church at Jerusalem was broken. Many of the apostles had been martyred or in flight. Clearly, great changes were precipitated here, and the status quo ended. The fall of Masada ended all hope that somehow the past conditions of the Jewish nation could be regrouped or recreated. Jesus takes extravagant notice of the works of each of the churches, and, for the most part, was much pleased with this early church of Ephesus. The fall of the beloved city ended the Jewish Christian dominance. With both Peter and Paul martyred, and with Jerusalem in ashes, the Gentile Christians and even the Jewish Christians were left clinging to John as the last outpost. 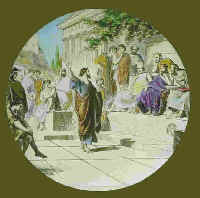 In Ephesus we find false apostles making an appearance and Nicolaitanes grasping for ascendancy. The Nicolaitanes were allegedly followers of Nicolas, who may have been the proselyte of Antioch, who was chosen to be one of the seven deacons to wait on tables (Acts 6:5). He may have fulfilled the meaning of his name, which is, "conqueror of the people." He started out as a servant of the church, but may have become an ambitious leader with his own agenda. This always becomes a problem when any of the Lords people create their own agenda. For more information on history of Papacy.